Besty McCleary is a good mom. 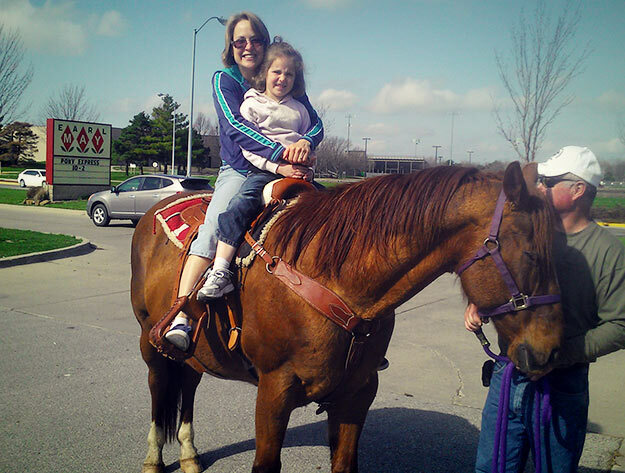 She stopped by the Earl May so her kids could ride a horse around the parking lot. Then she figured she’d “kick Adultitis to the curb” and asked to join in. She may have been the only adult who did all day. Which also makes her a Champion of Childhood. When you’re with a kid, you pretty much have carte blanche to let your inhibitions go and join them in their carefree adventures. They are pint-sized permission granters. It’s a pity that parents (and grandparents and aunts and uncles) don’t grab that opportunity by the reins every single chance they get. Betsy, for one, is proud she did. We are too!